Comeback Player of the Year: Buster Posey – San Francisco Giants – After missing most of the 2011 season with a broken leg which ultimately cost the defending champ Giants any chance of repeating as World Series Champions. San Francisco Giants superstar catcher Buster Posey is back and better than ever for the 2012 Giants. Posey is batting a robust .332, with a .406 OBP, and a .547 SLG%, to go along with 23 doubles, and 19 home runs, all this while playing a gold glove quality season at catcher. Honorable Mentions: Jason Kubel Arizona Diamondbacks, Adam Laroche Washington Nationals. Manager of the Year: Clint Hurdle Pittsburgh Pirates – Clint Hurdle has the Pirates set to break the 20 year losing season stretch, but even more important he has the Pirates in line to make the playoffs. Hurdle who was the former Rockies manager is the clear front-runner as long as the Pirates find a way to finish the season strong. Honorable Mentions: Dusty Baker Cincinnati Reds, Davey Johnson Washington Nationals. Rookie of the Year: Wade Miley Arizona Diamondbacks – What a unbelievable story Wade Miley is. Miley was expected to start the season in AAA Reno, but an injury to veteran Takashi Saito lead Miley to make the team as the teams long man in the bullpen. After watching Josh Collmenter struggle early in the season, Wade Miley was given a chance to start and has yet to look back. After posting numerous impressive starts Miley finally proved himself so much that he made the NL All-star team as the Diamondbacks representative. Most MLB writers feel that Miley is the leader at this point in the season with his 12-8 record, and 3.02 ERA. Honorable Mentions: Bryce Harper Washington Nationals, Todd Frazier Cincinnati Reds. Reliever of the Year: Craig Kimbrel Atlanta Braves/ Aroldis Chapman – This award is a anyone’s guess, Craig Kimbrel, Aroldis Chapman, or Aroldis Chapman, Craig Kimbrel. So far Kimbrel has 75 strikeouts in 43 innings, with 31 saves, and a 1.26 ERA. While Reds closer Aroldis Chapman who has an amazing 106 strikeouts in 57 innings, with 28 saves, and a 1.28 ERA. It’s hard to choose either Superstar closer, as both are Cy Young candidates as well. 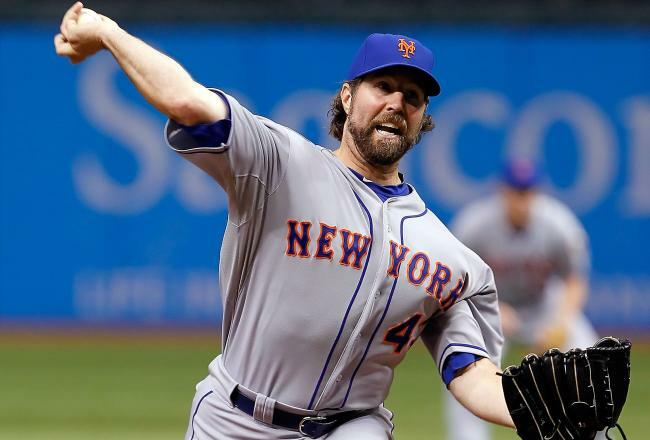 Cy Young: R.A. Dickey New York Mets – The great story of R.A. Dickey continues, as the Mets Ace continues to produce. Dickey who is currently tied for the MLB lead in wins with 15, also boasts a 2.72 ERA, with 166 strikeouts in 162 1/3 innings. However the Mets have fallen off the cliff since the All-star break. Honorable Mentions: Johny Cueto Cincinnati Reds, Stephen Strasburg Washington Nationals, Aroldis Chapman Cincinnati Reds, Craig Kimbrel Atlanta Braves. MVP: Andrew McCutchen Pittsburgh Pirates – Sure Andrew McCutchen was a 1st round pick in the 2005 draft, but not too many scouts could have seen McCutchen being the MVP caliber player he has been in 2012. 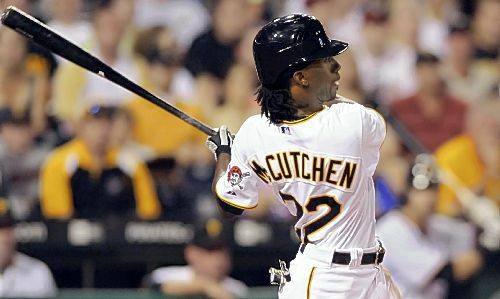 McCutchen is putting up numbers out of this world, .362 AVG, .422 OBP, .607 SLG%, with 23 Home runs, and 71 RBI. At this point McCutchen is the clear front-runner for NL MVP, and the award is Andrew McCutchens to lose at this point. Honorable Mentions: Joey Votto Cincinnati Reds, Matt Holliday St. Louis Cardinals, Buster Posey San Francisco Giants. Please e-mail us at: behindhomeplatebaseball@gmail.com with any questions and feedback. You can follow us on Twitter, and “Like” us on Facebook. Also You can subscribe to our website and have the daily Reports sent directly to your inbox.